Over 600 nursing staff of KLEs Dr.Prabhakar Kore hospital went on a indefinite strike from yesterday for their various demands. All the employees under the banner of KLES Hospitals Employees’ Union, the staff took out a procession from the hospital to the Deputy Commissioner’s office where it submitted a memorandum seeking immediate intervention of the Governor in directing the hospital management to comply with statutory provisions. The employees have been agitating for many days now. 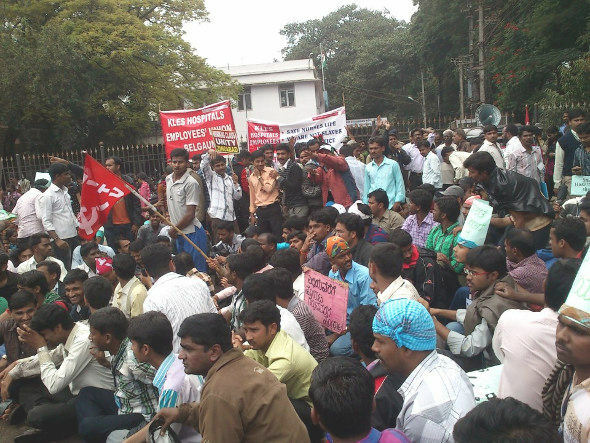 Staff was rightfully demanding overtime wages under Section 27 of the Minimum Wages Act; annual bonus of 20 per cent of their wages under Section 11 of the Payment of Bonus Act, 1965; overtime for working on government holidays as per the provisions under the Karnataka Industrial Establishment (national festival holidays) Act, 1963; leave and maternity leave benefits under the Karnataka Shops and Commercial Establishments Act, 1961 and Maternity Benefit Act, 1961. At the same time media persons were allegedly manhandled by the security of the hospital in a bid to stop them from covering the protest. Management got entire responsibility if life is lost . hospital salary committe peoples are increasing theire salary timely. what about other staff salary. Who is responsible for loss of people’s health and death in some cases. I have faced it with my family and I feel helpless. And I have seen many people suffering as we have and are suffering and no answer or a solution. We don’t have other option as well. Is there No value for patient and their life ? No body wants to think about it. Nor the hospital staff or neither management. Nurse given notice 30 days back for strike. Nurses are professionals, they should give at least minimum wages approved by the government. Livelihood is raising day by day. Still nurses are working on basic salary of 3000 per month. Nurses work in shift duty, life become hard for them, management force them for the strike. My appeal to the public is, please support nurses for the strike to get a minimum wages approved by the government. Please get well paid my dear friend but in due course of getting your demand you are not looking after the patient and more over you are letting them to die. And as you said if nurses are going through torture, you are torturing the patients in return and not the management. You are compromising someones life at your will and for what ? You also said 30 days notice was given for the strike but let me tell you, YOU are not dealing with Office , factory or machines here production will hamper. YOU are dealing with Patients and their LIFE. Find another way to meet your demand I feel Sorry but THINK Again ? yeah nurses are dealing with patients. But, don’t they have kids? Don’t they have a family? Management makes millions. Nurses working 10hr shifts get just 3000pm! How will they feed their family with such a salary? Their children also hv dreams whch must be fulfilled…..
@chetan medical professionals are on duty 24/7, saving ppl’s lives, yet they dont earn enough to look after their family. Imagine urself in that situation…..